Bell Sleeve Tops Just $26.99! Down From $90! Shipped! 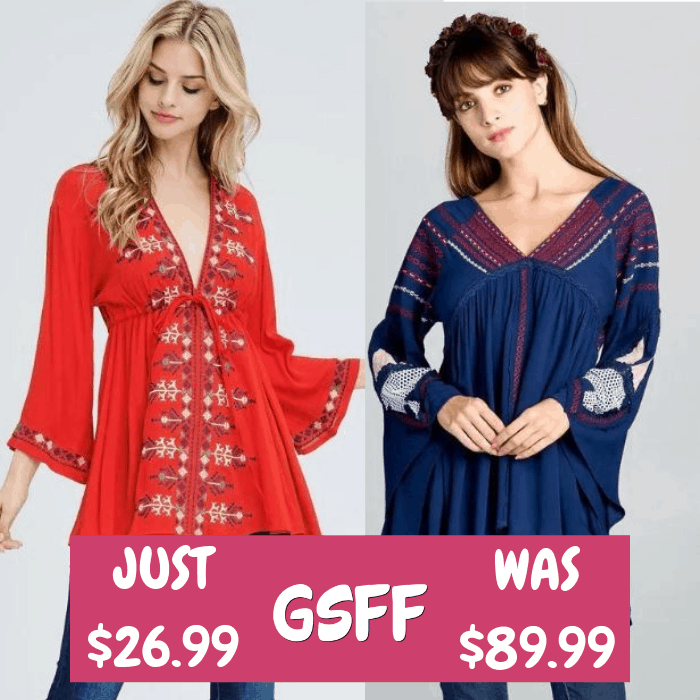 You are here: Home / Great Deals / Bell Sleeve Tops Just $26.99! Down From $90! Shipped! This deal expires on December 18! Hurry over to Jane where you can score these Bell Sleeve Tops for just $26.99 down from $89.99 PLUS FREE shipping! Cue your favorite holiday playlist and get the Bell Sleeve Tops with Hi-lo hem top, v-neck and embroidery (bell sleeves). It has a 3/4 sleeve v-neck top with beautiful embroidery on the front with a nice A-line fitting. Bell sleeve top with lace detailing. Includes adjustable tassels at the front.